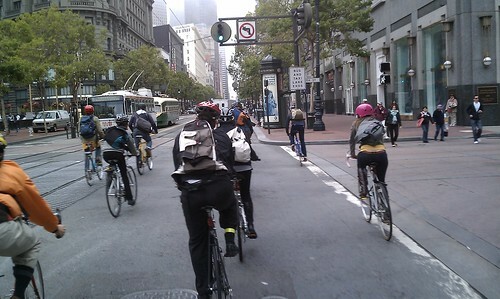 This was my ride down Market Street in San Francisco this morning. There were as many cyclists behind me as there were in front of me. These are all commuters, the most technical clothing item, a windbreaker. Shoes not clipped in, not toe clipped. This is bike culture happening before our eyes. Build the lanes, the bikes will come. I lived in SF for 10 years, then moved to Portland in 2001. I love it here, but seeing that Market St commute shot made me "homesick". Back then, there were no bike lanes on Market Street and the Valencia ones were just getting painted (amidst a lot of debate). Build it and they will ride - agreed!